Well gawd, this *really* pisses me off!! I've literally tried dozens of otc products for ED, more specifically something that could help with ED caused by long term pain medication use. Due to back damage and injuries I've had to use pain medication in addition to other pain therapy, but didn't figure out that the pain meds were causing other health issues, like very low testosterone and ED that doesn't seem to be related to the testosterone issue, even when that was fixed. I've been having to take Cialis for ED, Viagra and the other one don't seem to help much, but when we changed insurance recently and they didn't cover it and my pharmacist told me that it's almost 80 bucks A PILL, well I lost it!! Talk about some evil, money grubbing worthless people charging tens of thousands of percent markup! Ugh. Anyway I had no choice but to look for alternatives.I literally have tried dozens of OTC products and this was the only thing that helped! Hell, it worked better than the cialis that I've been taking! 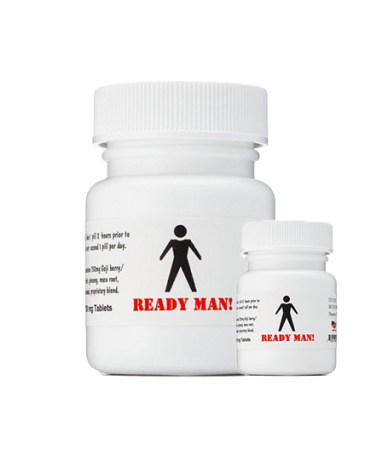 I suppose it's possible that they were using something from Viagra's patent list, I just doubted it when I read it because Viagra did almost nothing for me and Readyman still showed improvement well into my second day after taking it. This really blows, I only have two bottles left. I knew I should have stocked up more!! :(.Leave them alone Viagra, the non-rich people of the world need an option too! !